The Warhammer-Empire Forums now supoort the Tapatalk app for mobile device users. This app lets you view forums through a native app on your mobile device, the app is touch optimized and a great choice for when you are out and about. The Tapatalk app is available for iOS, Android and BlackBerry. They also have a private message notifier plugin for Chrome. Within Tapatalk you can find our forum though the categories of "Games" > "Tabletop / Roleplaying Games" or by searching for "warhammer-empire". 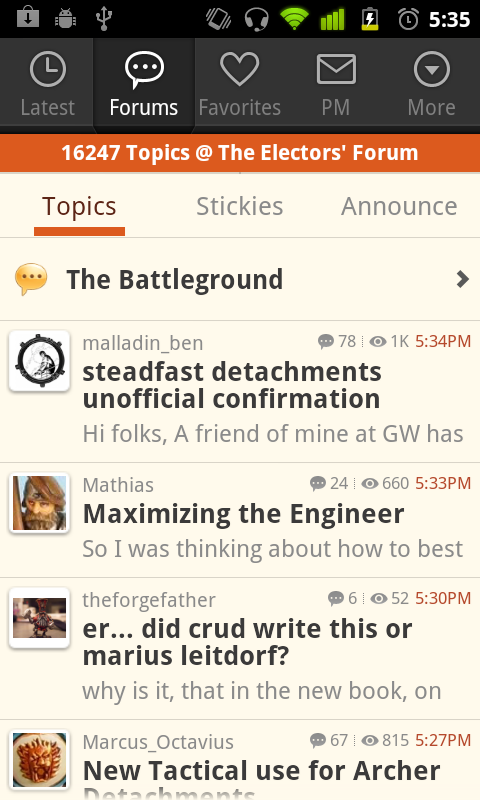 A screenshot of what our forums look like in Tapatalk. Woohoo! I noticed this morning and sat there on my mobile phone for the next hour checking out the site. Way to go Calvin! Very nice Calvin! I'm definitely using this app from now on.